A rehab program is only as good as its staff. 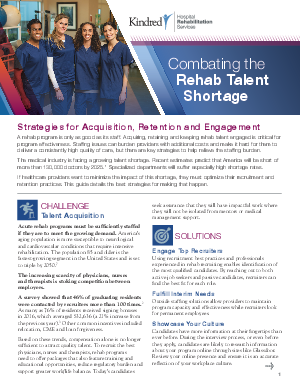 Acquiring, retaining and keeping rehab talent engaged is critical for program effectiveness. Staffing issues can burden providers with additional costs and make it hard for them to deliver a consistently high quality of care, but there are key strategies to help relieve the staffing burden. The medical industry is facing a growing talent shortage. Recent estimates predict that America will be short of more than 130,000 doctors by 2025. Specialized departments will suffer especially high shortage rates. If healthcare providers want to minimize the impact of this shortage, they must optimize their recruitment and retention practices. This guide details the best strategies for making that happen.